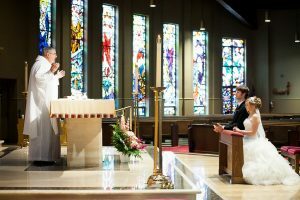 The Sacrament of Matrimony involves two baptized people, one or both of whom are Catholic, becoming husband and wife through a sacred covenant with God and each other. Engaged couples should contact the parish office at least six months in advance of their proposed wedding in order to set a date with the priest. Either the bridegroom or bride should be registered and practicing at St. Elizabeth. As you prepare for your wedding day with all the meaningful details and personal touches, please remember that your wedding ceremony and Mass in the Church itself must consist of Catholic readings and music. Appropriate readings for a wedding can be found at this link.